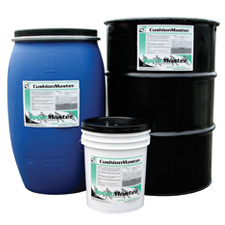 CushionMaster I is a 100% acrylic tennis court cushion coating fortified with fine rubber particles. CushionMaster I is designed to slow and cushion play for greater player comfort and enjoyment. 0.10 to 0.12 gallons per square yard per coat. 100% acrylic emulsion coating fortified with fine rubber particles. CushionMaster I is designed as a secondary layer to be applied following coats of CushionMaster II, as part of the SportMaster Pro Cushion System. CushionMaster I features fine rubber particles for smooth texturing. This minimizes any small voids on the tennis court cushion surface, to prevent pinholes or surface dimples in the color coating surfaces. As with any standard SportMaster System, surface preparation is very important. The surface must be smooth and level. All pavement repairs must be flush with the surrounding surface. The pavement surface must be cleaned entirely of dust, dirt, debris and all loose materials. New asphalt surfaces must cure 14 to 30 days prior to application. Newly cured or rough textured asphalt surfaces should first be coated with Acrylic Resurfacer (Technical Bulletin CMT – 3). New Concrete surfaces must cure 28 days prior to application. Concrete surfaces should have a medium broom finish or similar roughened texture. They must never be steel troweled. Etch surface with phosphoric acid and apply SportMaster Acrylic Adhesion Promoter. Dilute 4 parts CushionMaster I with 1 part water and mix to a smooth, even consistency. Additional water may be required to facilitate application in higher temperatures. Apply mixed CushionMaster I with a soft rubber squeegee. Do not apply additional coats until preceding coat has completely dried. Two to three coats are recommended for smoothness of the tennis court cushion layers. Temperature must be above 50ºF both during application and for a period of at least 24 hours after application. One to two (1 to 2) hours under optimum drying conditions. Indoor applications are substantially affected by temperature and available ventilation and will dry more slowly. Wash tools in water before tennis court cushion material dries. Be sure to protect the finished tennis court cushion surface and prevent damage from heavy equipment, benches, etc. The soft surface of the tennis court cushion should be protected with boards or dense mats, so that the weight of heavy items is spread out over a larger area. This should minimize the potential for dents or tears in the surface, when ladders, scissor lifts, or other equipment is needed on the courts. View in Catalog 5 gal.Pail 50 lbs. 55 gal. Pail 550 lbs.